Drawing inspiration from America’s vibrant food and drink scene, each dish reflects different elements of the country’s cultural identity, whilst the signature cocktail menu has been inspired by past American presidents. Under the leadership of the Executive Chef, Pablo Peñalosa Nájera, POTUS is known for serving the highest quality interpretations of America’s most-revered and well-loved classics. The bar and restaurant space is modern and sleek, and makes for an elegant dining space. We had the menu explained to us by the manager of the restaurant, who made every dish sound exceptionally tempting and as a result we order over half the menu! For starters we tried an exquisite New England clam chowder with creamy potato and bacon soup, crispy quinoa, as well as the BBQ pork belly served with Bromley apple sauce and bourbon caramelised apples. We also tried the fried soft shell crab with POTUS’s buffalo sauce and buttermilk blue cheese dressing. Each of the starters were extremely enjoyable and cooked to the highest level. Moving on to the main courses, I order the roasted free range duck breast with crunchy sweet potatoes, beetroot red fruits purée and pistachios and the truffle mac & cheese to share. Both dishes were served with contemporary twists on the classic versions and we were very impressed. The most inviting and imposing dish on the menu is the cowboy steak, served on the bone, chimichurri and countryside potatoes. The beef was cooked to perfection and practically fell off the bone - exactly what is expected from a dish which costs nearly £100! Our desserts didn’t fail to impress either! 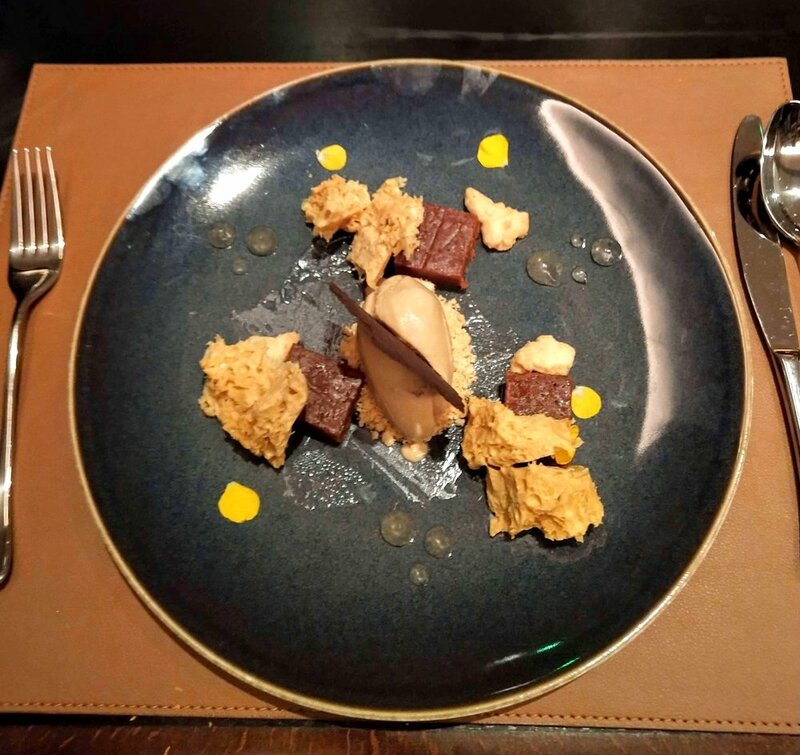 The bourbon and pecan with bourbon gel, praline pecan sponge and coffee ice cream, and the Down Mexico Way spiced chocolate tart we exquisite desserts and the perfect way to end an indulgent meal. POTUS bar and restaurant aims to be a fine dining restaurant and the prices are reflective of this. However aside from the £90 cowboy steak there are reasonably priced dishes on the menu, such as the fish and vegetarian dishes, meaning it is possible to eat here on a mid-range budget. We were very impressed with the quality of the food at POTUS bar and restaurant as it was far superior to other hotel restaurants. With new takes on firm favourites like the New England Clam Chowder and Truffle Mac & Cheese, the restaurant utilise the finest and freshest ingredients to portray the diverse American character, offering the very best of American cuisine. See the menu at POTUS bar and restaurant.